Adults are bright green with very small, irregular white spots in down the spine and yellow belly scales. Hatchlings are usually bright yellow, with occasional bright orange or red individuals. Green Tree Pythons are completely arboreal (tree dwelling), and rarely descend to the ground. They are able to dangle most of their length from branches by holding on with strong, prehensile tails. The young are hatched from eggs and are lemon yellow to a reddish orange. The bright green color (from which this species gets it’s name) completely fills in by 6 – 8 months of age. Mating and egg-laying occurs from November through January. Female Green Tree Pythons coil around the clutch of eggs, warming them by shivering and twitching. She will remain coiled around her eggs until hatching in 45 to 52 days. 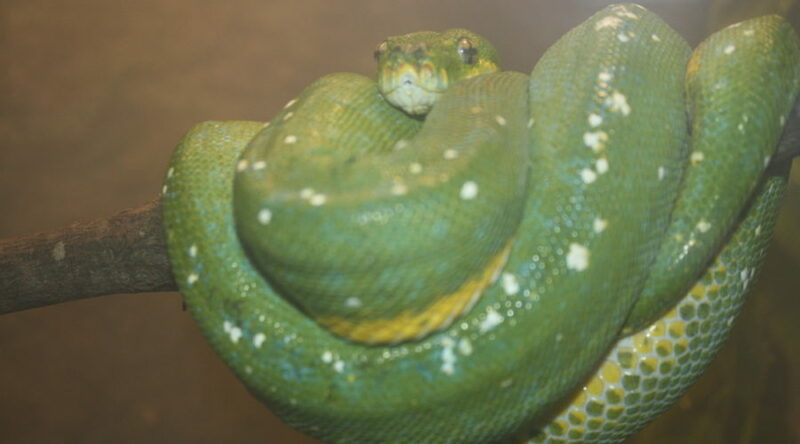 Green tree pythons are well known using their tail to lure prey closer. The snake lowers its tail and wriggles the end to attract a prey. Younger animals exhibit this behavior more often than adults. Captive animals will also use tail luring when hungry.